We are committed to provide our clients with the highest quality of products, says Anthony Micallef, Office Group managing director. The market for office printers and multifunction products has been fiercely contested for years, especially because it is nowadays widely acknowledged that modern digital machines managed by complex yet easy-to-use software are a catalyst for any business. Office Electronics Limited was established in 1980, in a time when the development of office equipment was turning towards electronic industry. In a period when very few companies in Malta offered these services, OEL was already supplying leading brand electronic solutions to its clientele. In 1984, at par with the growth of oil companies in North Africa, the company expanded its overseas department and in 1985, a sister company, Office Technology Limited was set up to cater for the needs of overseas clients. Office Group Limited was established in 2006 when formerly sister companies Office Electronics and Office Technology merged their operations. “Today we are proud to have a vast client base both in Malta and North Africa, covering most large organisations, government departments and corporations. We are committed to provide our clients with the highest quality of products, achieved through close cooperation with all business providers whose products are part of our vast supply chain. This helps us ensure high quality tailored solutions at all times,” says Micallef. Since 1980, when the company was established, Office Group reached its peak in January, 2009 with the announcement that Konica Minolta, world renowned Japanese manufacturer in imaging business solutions, chose Malta in cooperation with Office Group Limited to open its Central Asia, Middle East and Africa offices in Malta. Malta was chosen as the ideal base to keep one foot in Europe while getting closer to and improving relations with customers in the CAMEA market and beyond. Sales, technical and training facilities were expanded and are offered to more than 40 countries from Konica Minolta’s premises in Malta. Having acquired a great deal of business experience in African and Arab countries, Office Group Limited is Konica Minolta’s valued business partner. In fact, in 2013, Office Group Limited celebrated 25 years as Konica Minolta sole distributor for the local market. Konica Minolta classifies Office Group Limited as one of its preferred partners and distributors in the Central Asia, Middle East and Africa market. OCE constantly places Office Group Limited among the top 20 companies worldwide for its results and business development. 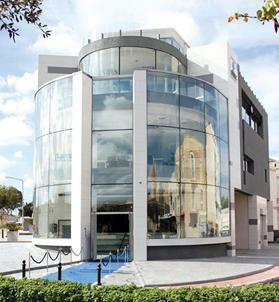 In September 2011, Office Group Limited opened, together with Konica Minolta Business Solutions Malta Office, a new head office building in Birkirkara. Spread over five floors, the business centre brings together all the group’s divisions under one roof. “One of our main investments is in our staff,” says Micallef. “We believe in highly trained staff, geared towards the ability to answer any client need and queries. For more information visit www.officegroup.com.mt.